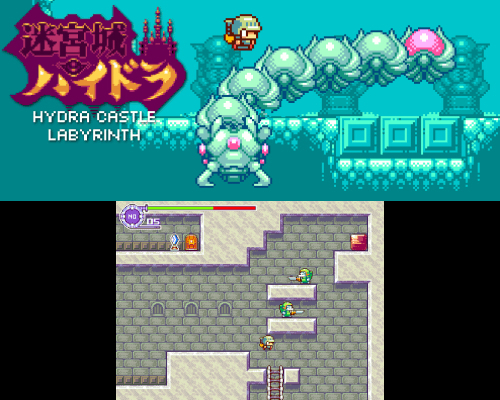 This is a port of the amazing game "Hydra Castle Labyrinth" for Xbox. The original game was developed by E. Hashimoto (a.k.a. Buster). The game is funny, deep, plenty of secrets and epic bosses, and runs very well in the Xbox! In case you didn't notice it: you must press UP to open doors, to save the game in the saving points (yes, those blue diamonds that you fill find near each door, are saving points), and to get the treasures. Pressing UP in front of a door, you will open it (if you have the needed key!). Pressing UP in front of the saving points, you will save your progress (you will be able to restore the game in that point if your character dies later). Pressing UP in front of a treasure chest, you will get it. The game can only be saved in the checkpoints (those blue diamonds that you will find near each door). Put your character in a checkpoint and select UP, and the game will be saved (it will overwrite the previous saving). When you finish playing, I recommend that you exit from the game in the proper way: press BACK to go to the main menu, and select the EXIT option. If you don't exit from the game properly (for example, if you turn off the console), the game will still be saved and you will still be able to restore it, but the game will display a warning message when you launch it. Only one bug is known, in the final screen of the 5th level (Lolidra's Cavern), just when you face the 5th boss: your character sometimes goes to a wrong position of the screen, making impossible to win the fight. If that happens, we can only reload the game and go again to Lolidra's room, to fight again with the monster. Is JTAG release the same as Retail release?